The optional CD has been expanded to include the ENTIRE BOOK plus supplemental activities and resources. Ages 4 through 10.. 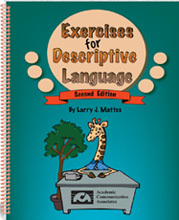 Challenge your students to describe events, objects, and situations clearly and precisely with the recently published second edition of this best-selling book. Skills emphasized include sequencing story pictures and retelling stories, describing details using precise vocabulary, finishing incomplete stories, and giving explanations. The activities help children to use precise vocabulary and to sequence information appropriately. Reproducible pictures and worksheets are included. The optional CD has been expanded to include the entire book PLUS additional activities and resources not contained within the book. Full-color pictures are included on the optional CD supplement that can be printed out or presented on the computer.